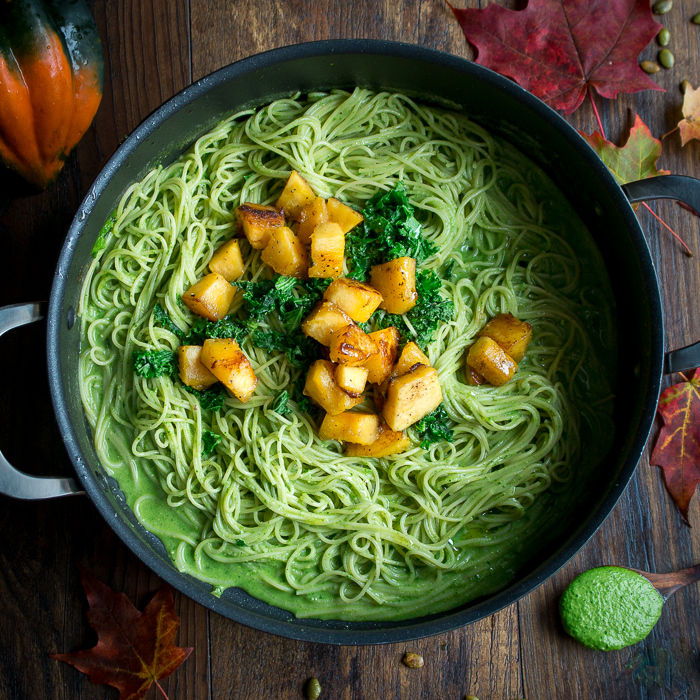 You are just going to love this One Pot Creamy Kale Pesto Pasta as it has all our favorite Autumn seasonal flavors in one delicious bite. We love slurping these delicious noodles. 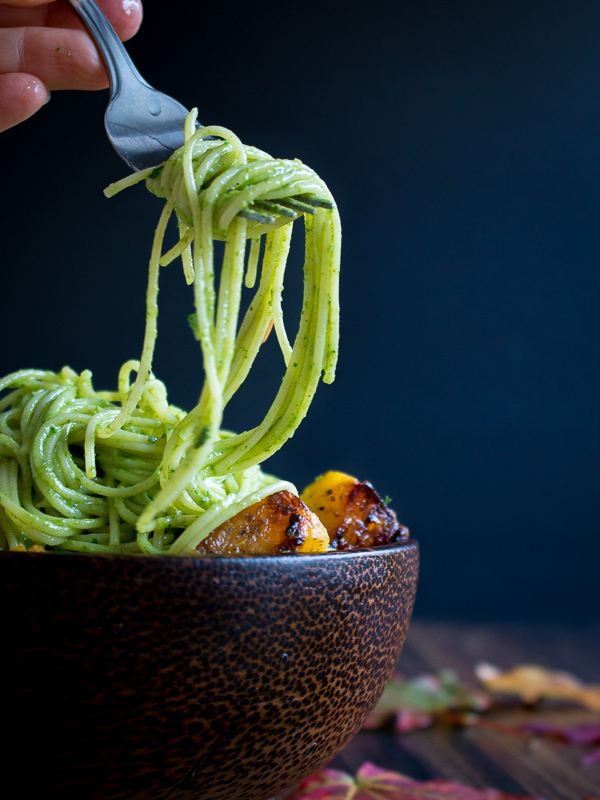 Why you need One Pot Creamy Kale Pesto Pasta in your life! What to cook when you don’t feel like cooking? Have you ever opened your refrigerator and said to yourself, “Oh my goodness, do I have to cook again tonight?” You just walk in from work and the kids are starving and cranky and everything is still frozen solid. We have been there - done that! Cooking under pressure is not fun and it is super stressful. 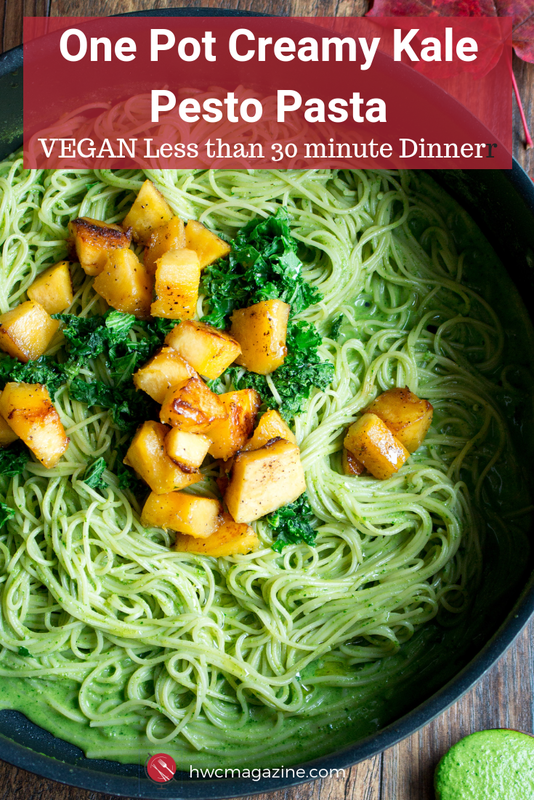 One Pot Creamy Kale Pesto Pasta is a solution to many of your problems. The recipe is mostly a pantry item special and kids love it and you can have it on your table in under 30 minutes. Do I have to use acorn squash? 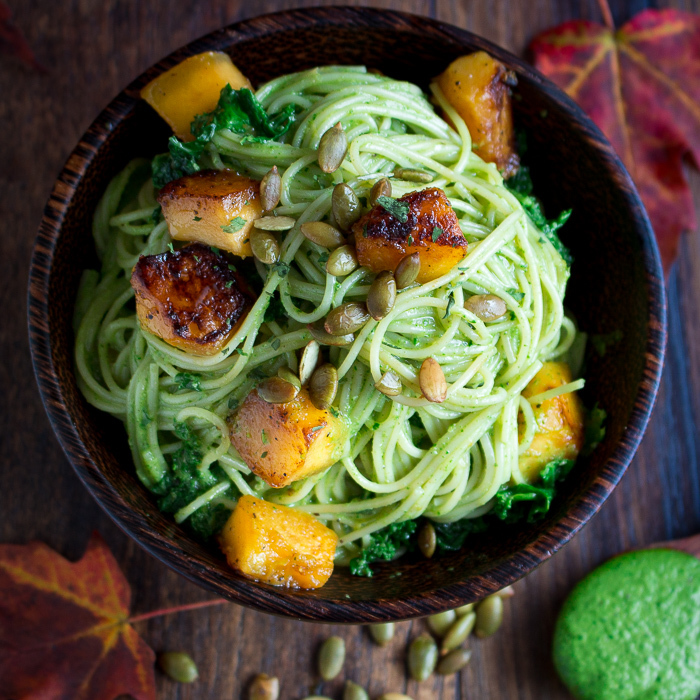 You absolutely do not need to use acorn squash in this One Pot Creamy Kale Pesto Pasta recipe. We just happened to have acorn squash on hand. If you like, you can use frozen butternut squash cubes or any fresh or frozen vegetables your little heart desires. (or vegetables that your kids will eat). We best add that in, right? A wise old farmer once told us that ingredients that are harvested in the same month, most generally pair well together. Do you agree? Both acorn squash and kale are harvested in the fall. 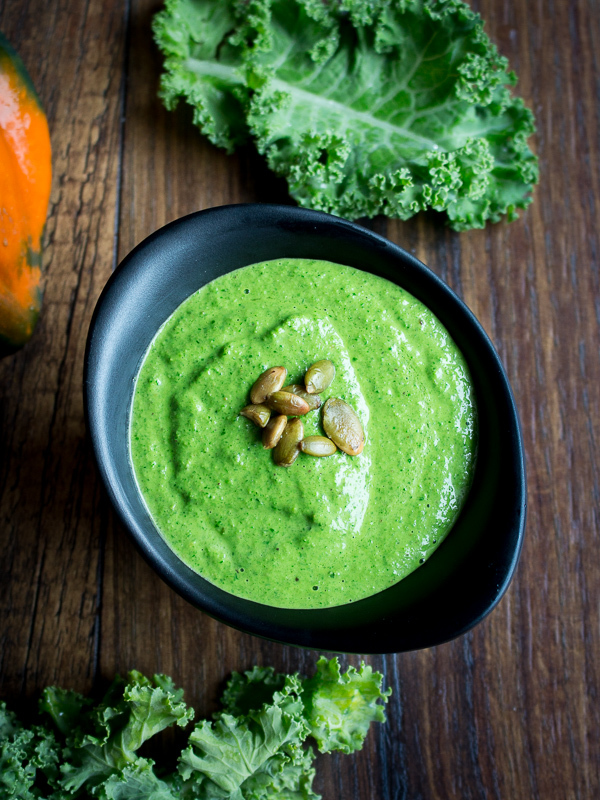 We know that many of you are rolling your eyes about the kale but look how bright green this vibrant this sauce is! 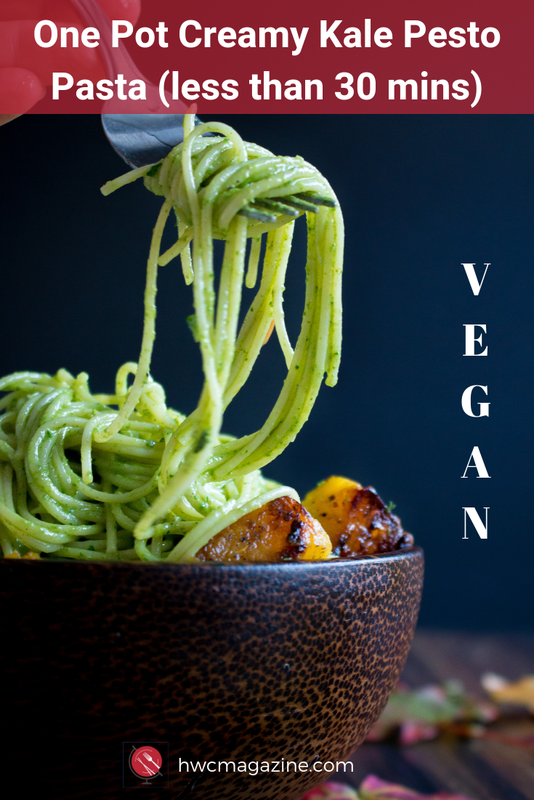 Kale has this earthy and slightly tangy taste and the pasta is creamy so it adds this little bite of sharpness to the recipe. However, feel free to swap out with spinach or even just make a traditional basil pesto. If you are in a time crunch, use jarred pesto. We know how crazy life is. Be good to yourself. Take some shortcuts when you need to so you can get back to the important things in your life. Roasted Pepita Butter makes One Pot Creamy Kale Pesto Pasta Fabulous! Did you get a chance to read our recipe for Easy Roasted Pepitas and Roasted Pepitas Butter? Pepitas are shelled pumpkin seeds and are also harvested in the autumn season. Roasted pepitas Butter takes this One Pot Creamy Kale Pesto Pasta from okay to let’s have 2nds and 3rd helpings. 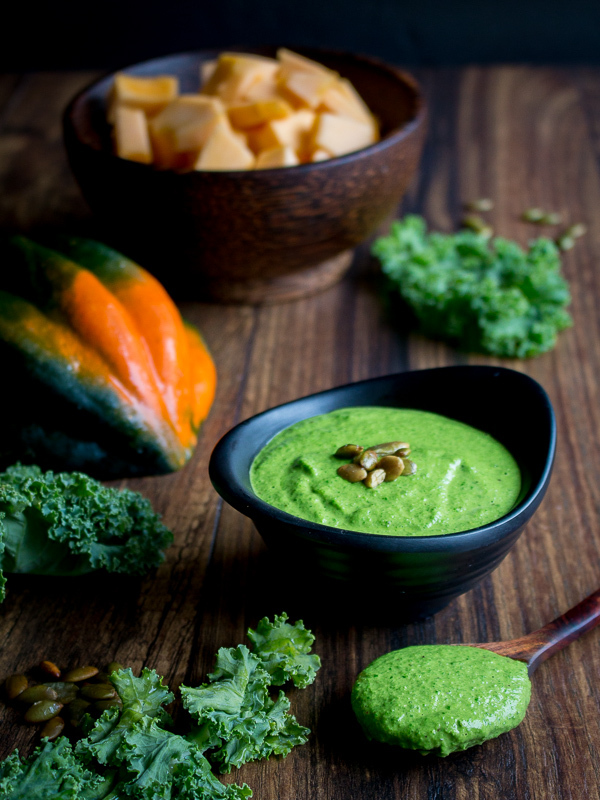 Roasted Pepitas Butter gives this pesto an extra creaminess and a delicious nutty flavor. We also topped our One Pot Creamy Kale Pesto Pasta with a few Easy Roasted Pepitas for that added crunch to this recipe. Every month All That’s Jas and Healthy World Cuisine collaborate to bring to you a delicious noodle recipe. Be sure to check out her 5 Ingredient Mediterranean Feta Mac and Cheese for an easy weeknight meal. We love to see what you are making in your kitchen so be sure to tag your Instagram noodle recipes with #NoodlesWithoutBorders hashtag. Whether you have made one of our noodle recipes or one of your own, be sure to use the hashtag. What is your favorite noodle dish? What noodle recipes would you like to see on Healthy World Cuisine (HWC) Magazine? Please leave your comment down below. 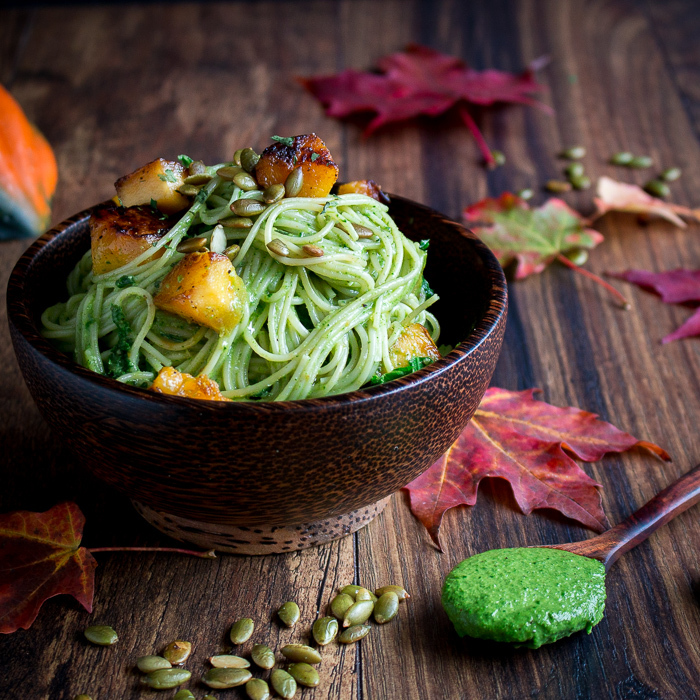 If you are looking for some more Worldly noodle inspiration be sure to check out our Camote Bihon (Sweet Potato Noodles) from the Philippines, Shrimp Tempura Udon Noodles, Homemade Tagliatelle Pasta with Zucchini Blossoms or a fun Creamy Kabocha Truffle Pasta for an autumn tasty bite. 1Add olive oil and onions into a pot and saute until golden and aromatic, add garlic stir for a minute. Add kale and toss just until the kale turns bright vibrant green. Season with salt and pepper to taste. Remove from pan and allow to cool slightly. 2Add another tablespoon of olive oil to the same pot and add your acorn squash and saute uncovered until slightly golden and fork tender, around 5 minutes. (You can add a tablespoon of water to help steam the squash and speed up the process) Season to taste. Remove cooked acorn squash from pan and set aside. 3Make kale pepita pesto. In a food processor add your cooked kale, onion, garlic, ¼ cup olive oil and ¼ cup roasted pepitas butter. Season with salt and pepper to taste. Process until smooth and bright green. 4 Add vegetable broth to your pot, salt and pepper to taste and angel hair pasta and boil for about 4 minutes or according to the pasta directions and the broth is mostly evaporated but with some broth still left in the pan. Stir frequently in the pot and cook until aldente. 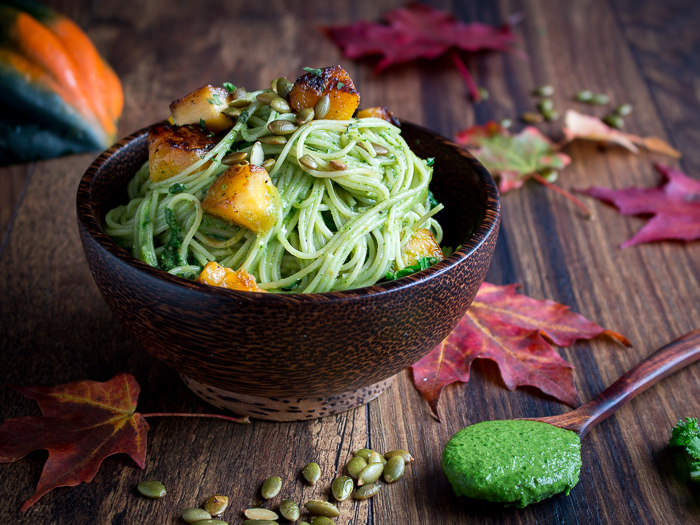 5Add the kale pepitas pesto to your cooked one pot angel hair pasta and toss well. 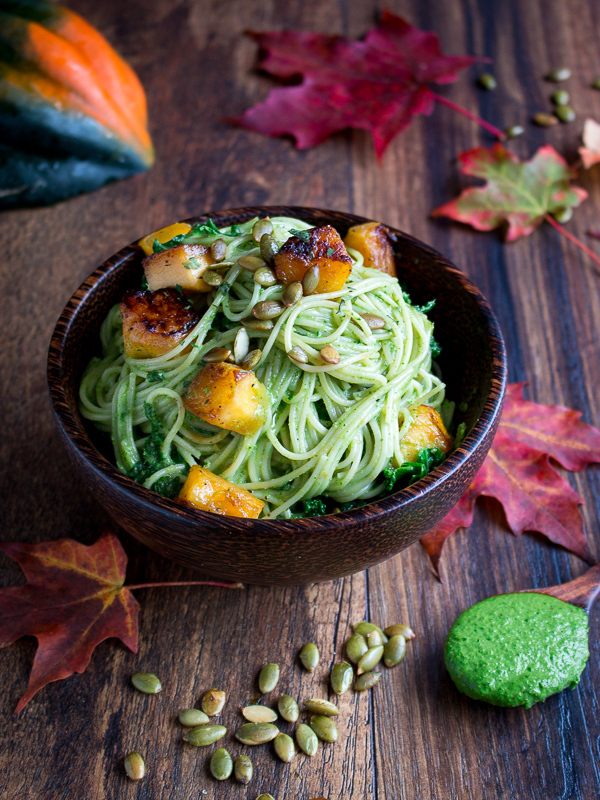 Divide pasta into 4 bowls, top with pan roasted acorn squash and top with roasted pepitas. Enjoy! 6Chef’s notes: If you are not vegan or dairy intolerant a little shaving of parmesan cheese is delightful as a garnish. If you do not have pepitas or pepitas butter, you can substitute with a few roasted sunflower seeds, almonds, walnuts or pine nuts in your pesto. You can also make with gluten-free noodles but you will need to adjust cooking time accordingly per the package directions.